While groom's cakes are not a tradition all over the USA, here in the south, we see cooler and cooler desserts at weddings and events every year. We just wanted to take a second to brag on all the great dessert makers and the brides and grooms who imagined these fabulous treats for their guests to enjoy. Groom's cakes can fit the decor theme of your wedding. Pistachio. Buttercream. Honey Rum. and beautiful to look at? Great work by the folks at Blue Note Bakery in Austin. This cake is all about Hunting, Fly Fishing, & Dogs - Sidniis a preppy southern bride, and she loves to go fly fishing with her husband Jay. They have three dogs that they love, too! You can watch their full film from their Outdoor Escondido wedding here. Laura's husband Marcus loves to golf. In fact, people joked at the wedding about how strong his love for Laura is because of the tournaments he was missing for the wedding. Laura embraces his passion for the sport, and so she teamed up with her wedding planners DFW Events and the well-loved bakery Creme de la Cookie (Dallas, Texas) to create a golf themed table with cake balls made to look like golf balls. Of course, Marcus loved it. The couple's monogram is on the flag. Click here to watch their full film. Other university themes we have seen: Baylor University Football and a Law school building where the groom spent so much time studying! 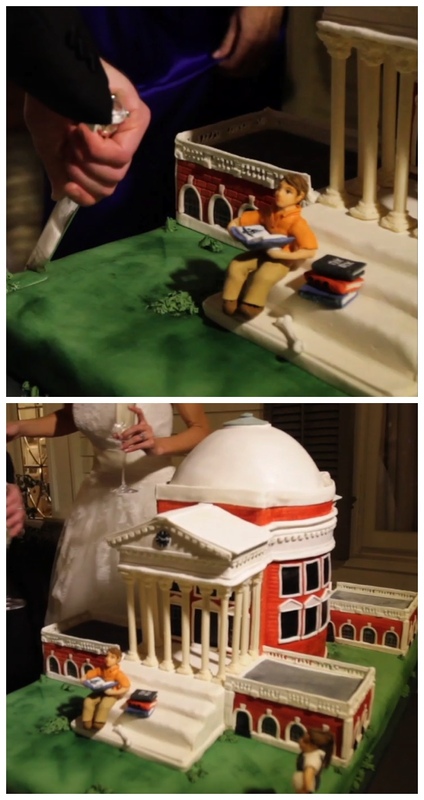 The Baylor Cake was created by Sophie's Choice Bakery for a rustic outdoor wedding near Fredericksburg, Texas. (Planning by Viridian Design from Kerrville, TX.) There was a pretty big Baylor crowd in attendance, and the indoor bar at the Mansion at Riverhill Country Club heard many "sic 'em"s that night as the reception guests filed in to watch moments of the football game between dances. ...and A Carolina Tar Heels Cake! This cake was made by The Cake Plate in Austin and was a part of an event designed by Clink, an event and party planning company. They are top-notch. We hope you enjoyed looking at these cakes and got some ideas for parties of your own--and you should trust us--they were delicious! You can watch read more about our wedding videos on our blog, or watch them all on vimeo.